Looks like a beautiful book to have! Great selection ! I am hoping to acquire a new studio next year having travelled for two years – this would be absolutely perfect to display in the waiting room (and use, of course!) where it would inspire my students. The anthology appears to be beautifully laid out, and the fact that it features pieces that are accessible to such a wide range of age and experience levels is a real bonus. Looks like a collection of my favourite pieces! This would make an amazing prize for a hard working student. Great collection! As we say in my country, “may these books travel well”!!! This is the kind of book that would be a true friend for life. Wonderful! What a beautiful book! It would make a lovely gift for one of my students. Such a beautiful book! Love that the selection includes pieces for pupils at all levels. I’d love to have this for my studio! Lovely book – I think it’s a great selection of music. Fantastic choices of repertoire and a lovely cover, it will be a great reference book for me and also for my students to play. Hi Melanie, I just checked it out on Amazon. This is an amazing collection of works. What a great source for alternate repertoire and to explore music through the ages. They would be a great source for sight reading material too. I sure am interested in this anthology and would be very proud to have it in my music library. This is super awesome. Great resource. Faber books are fantastic, and this repertoire list looks like a must have. Thanks Melanie! What a collection. Looking forward to seeing this wonderful volume! A great collection and perfect for an aspiring pianist. What a gorgeous compilation with a fabulous collection! Great work! Great Selections with some very interesting and not so well known composers and pieces ! Would be great to introduce to students in the pedagogy class. Congratulations ! You are very passionate and that shows in the beauty and quality of this publication. Congratulations! This would be a lovely resource to have!! I would love copy- for me and my students! Entering another wonderful give-away. Thanks! I would love to own this and use it with my 60 students! You did a great job with it! That would be an amazing resource book to pass onto one of my talented students. She has been composing for a while , and loves getting her own copies of good scores. I have been looking forward to article about the new release and the content of the book. I would love to win a copy for myself. Excellent anthology that would be nice to have on hand or to give as a gift. Wishing you a very Happy Autumn…thankful for life and dedicTion to the art! This is a lovely collection of pieces, Melanie. I would love to have it in my collection. I need a good companion book for my students. I think this is a good choice on my books library. I’m sure the book definitely could delight on my piano with the beautiful repertoire ! Awesome. My high school students have played many of these. Ready to introduce them to the younger ones. What a lovely idea for an anthology. I agree that this collection would be a great gift for a student. It’s also handy having a wide range of pieces of varying levels in one publication. Wonderfully compiled! A great resource for both teachers and students! What a fabulous collection of music. Would love to introduce this to my piano students! It’s a great collection congratulations! What a stunning book with a fabulous collection of pieces! This would be a delight for me and my pupils. A great collection of pieces spanning a wide ability range, beautifully presented. Thanks! this would be a ‘forever’ book for a student! This anthology looks fantastic. It would be a great asset. What a delicious and exciting collection of pieces! 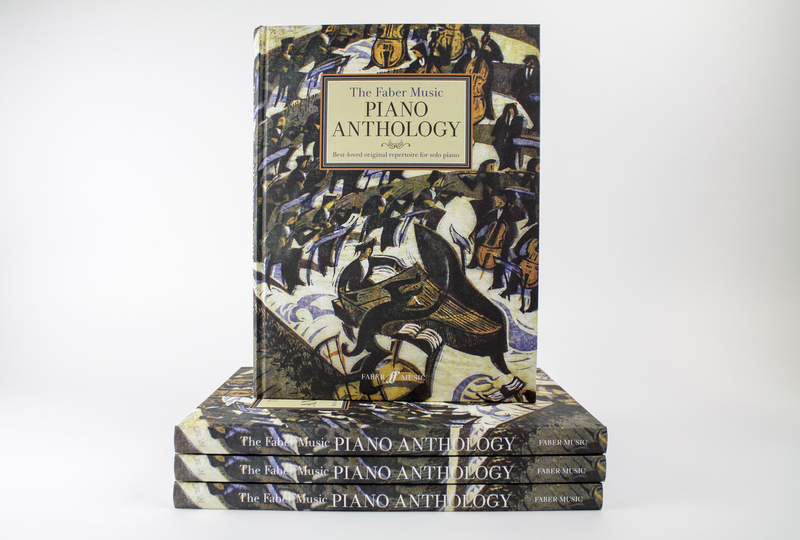 I would absolutely LOVE to receive a copy of your new Faber Music Piano Anthology! Though I have to admit I’m not sure whether I would should give it as a gift for my sister, use it in my teaching or just keep it for my own enjoyment?! Perhaps I’m going to need three copies! I would love to own this – although I’m not sure the rather inadequate stand on my piano would cope! What a great resource to have! Im in the second year of developing a proper program for an elementary and junior fine arts school. This volume would surely add to the small library we are building. Thanks so much for compiling this work. Looks like a great anthology! Nice choice of repertoire. What a beautiful book! It reminds me of “Music For The Home” a red hardback volume with gold lettering – it was found in every home that had a piano, and was a treasured possession. I learned the Moonlight Sonata and so many timeless works from it as a child. It would be brilliant if your new Anthology rekindled this, inspiring pianists young and old with the joy of beautiful music in a special edition, now with 21st century design. Of course, I would treasure my own copy too! Oh I meant to say that the News Chronicle Musit for the Home was in every home in the 1950s ! What an absolutely stunning-looking book! This would make a great gift, for sure. This fantastic collection would be a wonderful addition to my music library! Hope I’m not too late for the contest! I’ve loved using all of the Faber music beginning with their first series of Adventure books and solo piano sheet music. This would be a lovely addition to my personal library and studio. Thank you for the opportunity. What a beautiful collection of pieces. The books themselves are lovely too! Looks like a wonderful compilation! My coffee table so needs this book. Thanks for making such a beautiful gift, Melanie. A wonderful collection. Music worth playing and worth listening to. A rich selection for every piano lover!